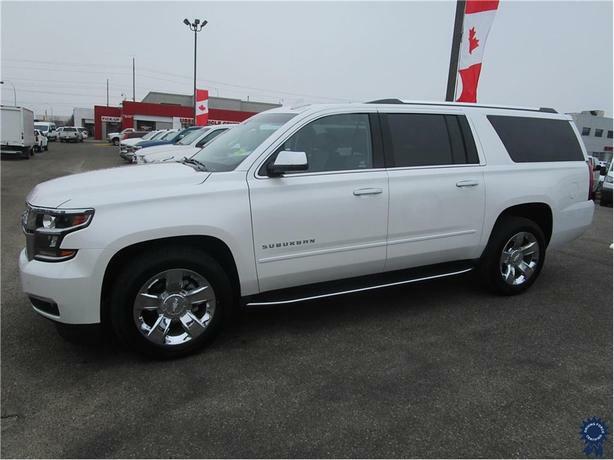 This 2017 Chevrolet Suburban Premier 8 Passenger 4X4 SUV comes in a stunning iridescent pearl exterior color, 6-speed automatic electronically controlled transmission, 3.42 rear axle ratio, engine block heater 150-amp alternator, and with tons of features including, heated, cooled and vented perforated leather seats, front bucket seats, middle bench, heated steering wheel, heated rear seats, remote start, navigation, Sun Entertainment and Destinations Package, 2nd and 3rd row dual Blu-Ray/DVD Entertainment System, rear view camera with park assist, H.U.D (Heads-Up Display including digital multi-function read-outs), Bose audio with AM/FM/SiriusXM satellite capable radio and USB ports, 20-inch chrome wheels, blind spot monitor, lane departure warning, cross-traffic alert, multi-zone climate control, locking/limited slip differential, keyless start, heated and power folding mirrors, hands-free liftgate, power/tilt sliding sunroof with sunshade, side steps, power tilt/telescopic steering wheel, rain sensing wipers, steering wheel audio controls, multi-zone power outlets, power-adjustable pedals, power activated rear hatch, trailer tow package with hidden hitch, WiFi hotspot, balance of the factory Chevrolet warranty, both sets of keys, all books and manuals, AMVIC inspection, and has been certified to our high standards. The GVWR rating is 7,500 lbs (3,402 kgs). The 5.3-litre EcoTec3 gas engine with Active Fuel Management provides 355 horsepower at 5,600 RPM and 383 lb-ft of torque at 4,100 RPM. Touch base with us to discuss purchasing or financing options that are right for you and experience the difference you will only find at DRIVING FORCE Vehicle Rentals, Sales and Leasing.